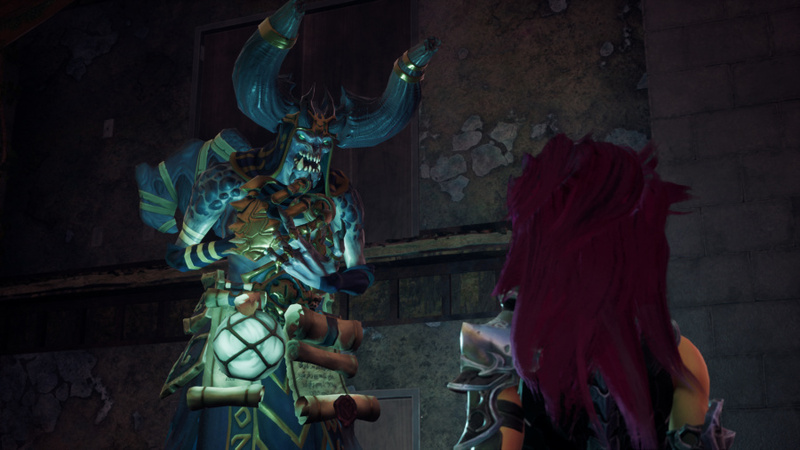 The Darksiders series has always been an unexpected surprise. It's managed to garner a cult following, despite a proclivity for liberally borrowing mechanics and design elements wholesale from better titles. Earning respectable reviews and enough of a following to warrant several current gen remasters, it even managed to survive the shuttering of its studio and auction of its IP. 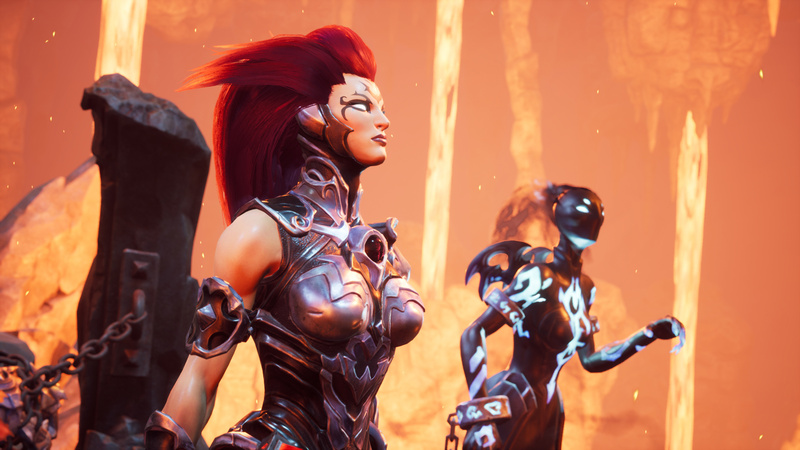 Darksiders III comes from Gunfire Games, which comprises devs from both the original game’s creative teams. Emerging from a long silence after its initial announcement at the beginning of 2017, it feels like a game very much out of time. In stark contrast to God of War (a franchise that’s a key part of Darksiders’ DNA), which completely overhauled its formula while remaining true to established series roots, this title feels like it’s straight out of 2010. It's the same brawler/RPG hybrid that the first two games were, sprinkled with environmental puzzles and platforming. The story runs in parallel to the events of the first game, and even the NPCs you meet along your journey mirror those that War and Death encountered. Fury is very much following in her fellow horsemen’s footsteps. These games have always worn their influences on an armour-clad sleeve, but becoming a pastiche of itself is a new tactic. 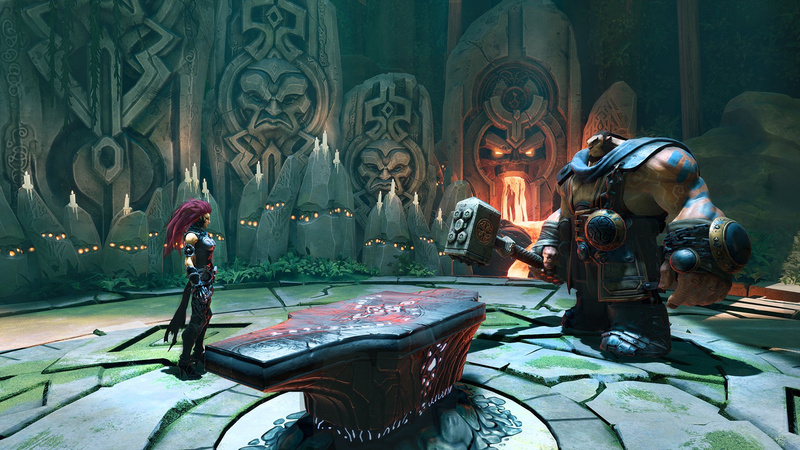 After such a long wait between titles, it’s a shame there isn’t anything fresh about the core Darksiders experience. Yet, despite its failings and archaic execution, DIII is not without charm. After an exposition-heavy run through of the series' previous events, purple-haired apocalypse horseperson Fury is thrown into the rubble of the mortal realm to track down the seven deadly sins. Soon, she stumbles onto the warring factions of heaven and hell and a conspiracy against her kind. She sets out to track down the sins while piecing together the mystery of her betrayal. The plot is thin but engaging, for the most part, elevated by well-written characters and genuinely amusing dialogue. By far the game's biggest asset is its fiery protagonist. Fury is as fun to play as she is to watch. Berating the world around her with perpetual disdain, insulting her ghostly companion and grudgingly rescuing puny mortals, making them cower with her hateful stare, Fury is a blast. Cissy Jones follows likeable leads Liam O'Brien and Michael Wincott with another great vocal performance. Her balletic fighting style is also enjoyable and feels markedly smoother than the beefy moves of War and Death. Starting off with a devastating chain whip with attacks that cover a wide area around her, the default weapon is useful enough to remain the go-to damage dealer throughout the game, though Fury unlocks further weapons across her journey. In classic Metroidvania style, her new weapons not only change her appearance and move set, but also unlock new traversal abilities that open up previously blocked pathways in the game's intersecting map. Highlights of her arsenal include a hammer that adds a meaty impact to counters and a multi-target ranged glaive. Combat comprises the basic nuts and bolts of any brawler; canned combos and a dodge that slows enemy movements and triggers a powerful counter when timed well. Switching between weapon forms - or 'hollows' - on the fly is smooth, and the secondary weapons are satisfying, if a little samey. You'll always be pulling out that whip in a pinch. 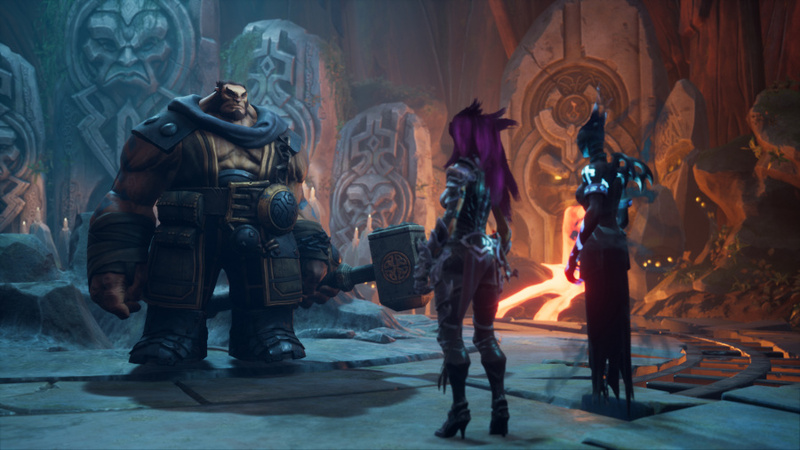 Darksiders III proudly continues the series tradition of pulling inspiration from other titles to create a Frankenstein mishmash of styles. Unfortunately, there's a new influence that doesn't quite gel with the rest of the game. Fixed spawn points, the slight delay of selecting and using items in battle, having to reclaim souls after death -- there is more than a faint whiff of Hidetaka Miyazaki’s oeuvre here. Unfortunately, in trying to meld the speed and chaotic nature of a western brawler with the precise dance of a Soulsborne title, Gunfire Games has shortchanged both. Combat isn’t overly difficult, but the ebb and flow of attack/dodge/heal feels unpredictable here. There's no reward for going on the offensive, and trading blows is often a dicey proposition, yet the game seems to discourage careful consideration. Enemy difficulty ramps up quickly after the game's opening sections, and on higher difficulty settings, dying and tracking back through an area becomes a needless frustration. Death far too often comes from a dodgy camera angle or annoyingly placed enemy packs. Boss fights aren’t too complex, but again, are marred by systems that aren’t really built for the finesse the game would like us to display. Some may embrace what the devs are trying to do here, but it’s hard to shake the feeling that these two very distinct styles don’t quite marry up. Visually, the bland environments and decidedly last-gen sheen is balanced out by exceptional character design. Fury herself looks great, and her opponents are gloriously over-stylised monstrosities. Avarice is a particular highlight, with his massive sack of gold and corpses, he perches atop piles of garbage and throws bathtubs at you. Enemy design is varied, with a welcoming colour palette that adds a cartoonish feel to the fantasy horror setting. 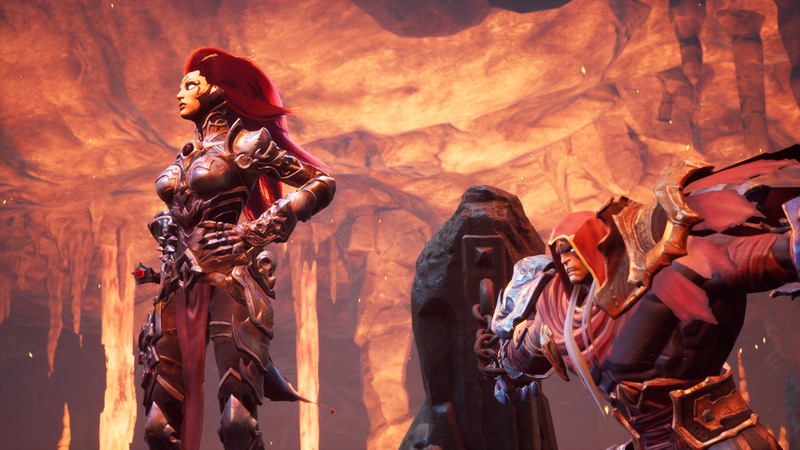 It’s a shame that there are so many small annoyances about Darksiders III, because much like its predecessors, a genuinely likeable game sporadically emerges from this frustratingly old-fashioned title. The shadow of a very different God of War looms large over Fury’s journey, but she still enthusiastically whips her way through the hordes of heaven and hell. Perhaps if Gunfire and THQ Nordic get the chance at another instalment, they’ll take some crib notes from the current state of the franchises that inspire them. Darksiders hasn't changed much since 2012. It's still a fun mishmash of genres with a great protagonist and undemanding combat systems, but it's a pity that it feels outdated compared to its genre peers and stumbles when injecting Souls-like sensibilities. So if you like the first games you will be happy? And yeah - looks like fans of the first games would love this as well. Yeah ‘stuck in the past’ was my first thought. Is the sequel that fans of the franchise never thought we’d get. Based on my very early impressions (~3hours) I probably agree with the score, but it’s Darksiders 3 on PS4 & I ain’t dreaming. 10/10. I think I'll be getting this. The flaws don't warrant the 6 for me. It should be a 7. I get why they stuck with the previous formula,since they did not want to risk to many things by adding to much new stuff after the previous studio was shut down. Afterall the 2nd game was not as Well liked because it added to much new stuff. All accounts say this is more like Demon Souls in its game structure and like Darksiders 2, not a sequel either but another prequel. @Flaming_Kaiser If you're a fan of the first two games, then I would give it a shot. I personally enjoy the series, especially the second game, but the added Souls-like stuff really marred the overall experience for me. 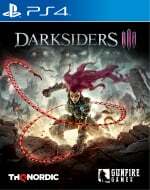 Darksiders is a cool series, I will definitely check the game but not on the release date. I remember Knack being criticised as being a game stuck in the past but I really enjoyed it all the same. I don't get why new games get criticism for it when Crash and Spyro are getting praised. Looks interesting, I'll be getting this but not on launch. I need to finish the first and second game first on ps4. Guys, look at the score description; It's Not Bad. And based on the review and previous games, that seems fair. It has always been an okay series. Nothing particularly stand out or memorable but a decent play through if there's a lull in more exciting releases. I had good time with the first two but I never felt any need to go back to them after completion. The series adequately fills the hole left by the Legacy of Kain series (they are basically the same games haha) so I'll be getting this. Its good to hear its more of the same. Saw the first boss fight last night and I was disappointed they didn't do anything more creative. Since your chasing down the 7 deadly sins the game is begging for very unique boss fights. Something along the lines of what Ninja Theory did with DmC. @AdamNovice That Envy fight is not a great introduction to the game at all. I will say that the other boss fights are a bit more inventive. Avarice is my fave. I'll probably get the game in the future when it's discounted. I really enjoy the first two games, but with Spyro taking up my time and Smash just around the corner and January loaded with good games, it'll be on my purchase backlog. Whats wrong with a metroidvania? Bugs didnt lower RDR2 or Witcher 3 and they are just open world games. I'm going to get it once it hits 40 or so. It looks really smooth and fun! Sounds something like a return to the original Darksiders, which is definitely good with me. “Dated” doesn’t necessarily equate to “bad.” Darksiders 2, from what of it I’ve tried so far, really went off the rails from the feel of the first game. Maybe my judgment will change by the end, but the unnecessary RPG elements, weaker environments, and impactless combat let me down. This is exactly what I figured. It’s not like the trailers misrepresented the game, which is something I appreciate. This is a “wait for a deep sale” for me. I enjoyed the first two and undoubtedly will enjoy this one as well, but it won’t get to the front of my backlog until I’m particularly feeling the itch for that particular style of game. Probably one for a sale, I enjoyed 2 but not enough to be excited for this. Kind of disappointing but not really surprising. Loved the first 2 games and will surely get this but it'll be $30 by January, no point in getting it no it seems. Hopefully it's successful for them though so we can finally get Darksiders 4 as a coop hack and slash with all the horsemen! Not sure why every game needs to reinvent the wheel these days. Especially when indies have been going back to the 90s both in gameplay and graphics and they get a free pass. Anyway, I'll play it at some point and see if I agree with the review. I loved II on the Wii U. If it's similar to that, then I'll love III too! The fact that this game is being said to be “stuck in the past” is driving up its value for me. @Spectra We've had some fantastic games come out in the past couple of years that have all grown the action RPG genre in a lot of exciting ways, whereas Darksiders hasn't changed a jot, which was an issue for me. As for comparison's to other titles, the devs themselves are very open about their inspirations and I do feel that's part of the series charm. My frustration's with the lack of change, the combat and some aspects of the presentation aside, I would recommend this to anyone who liked the other games. What games have pushed this genre forward, and what changes were you expecting that weren't there? @Radbot42 Well, think of what has come out since Darksiders 2 that could be said to share a similar genre stable to the series. Bayonetta 2, Bloodborne, Hellblade, God Of War 2018, games that have done things with perspective and combat mechanics and progression systems that could be said to have driven the genre forward. To me DSIII felt like a game that would have been just ok even before these titles. I think the fact that it harks back to an older style of brawler adventure can be seen as a good thing. Although this is definitely not my central negative observation of it. Darksiders was always a 6/10 series. is the upgrading and leveling system same as the second game? @ShogunRok i love darksiders games, but gonna have to agree mostly 6 or 7. The characters in the games is what i like. Adding a little soulslike may be cool for me though, as i love that genre. @Ludens92 it's massively stripped down. There are no gear drops and only Fury's hollow weapons can be upgraded and augmented with special materials by the maker. Levelling your 3 base stats by giving souls to Vulgrim feels very Dark Souls-lite. I'm playing the first one just now, good game, but it is a poor man's God of War! But for about £2.50 it's great. @ShogunRok Classic ShogunRok comment...6/10 . @Fight_Teza_Fight I have high standards. Bought the game despite the only slightly above average review scores. The complaints people have aren't things that bother me. I don't mind a bit of a challenge and as for being more straight forward, I need a break from all the open world games I've been playing. I'm still interested in Darksiders 3 but will be waiting for a steep sale...and I still need to beat 2 anyway. I keep getting ads for this on YouTube and it seems like an early Xbox 360 game in terms of style. I thought it was maybe a port of an old game running at 1080p instead of 720p until I saw the title logo at the end. Better than God of war. God of war is the game that is stuck in the past with its removal of jumping and poorly designed camera.